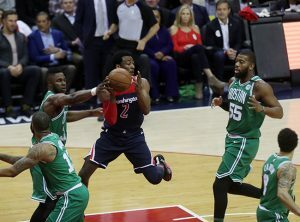 If the Wizards wanted to prove they were playoff ready, what better than to have to do it against a possible first round match-up in the Celtics. The Wizards were led by a strong performance of John Wall tonight with 29 points 12 assists. He also surpasses 5000 assists for his career tonight during the game, but didn’t want any of that to take away from what they have ahead of them after the finale in Orlando. “We have to keep everything in perspective. We could very well see these guys again this weekend in the first round, said Wall. They know us well and we know what to expect. We will just play hard tomorrow night and see if we are able to get the 7th spot. One of the big stories coming out of the game tonight was Otto Porter leaving the game and not returning in the second half with a right lower leg strain. He is questionable in the finale against Orlando tomorrow night. For the Celtics, locking up the 2nd spot in the playoffs minus Kyrie Irving makes other players have to step up to lead this team and one of those doing so is Jaylen Brown, who scores 21 points in the first quarter, but was unable to help his team after that. Should the Wizards win tomorrow night, they still could stand in the 8th spot and have to open against Toronto on the road, another opponent that the Wizards would not like to see in the first round.